NOTE: The comment on Selasphorus hummingbirds was relocated to a separate blog. “This seems really hot for January,” I said to Lillian upon arriving at the beach before 8:30am and it was already 73°. I then remembered thinking that exact same thing in previous Januarys. So I checked. [This is the sort of thing we retired accountants find amusing.] The Pt. Mugu temperatures below are from Weather Underground. This distribution looked a little odd, so I ran a few calculations and got the following results. For those who may be a little fuzzy about “standard deviation,” your school years long vanished in the rear view mirror, it’s often called the “mean of the mean.” The “mean” being what most people call “average”, it’s a measure of how far away from the average of a data point collection do the individual data points wander. In the case of our set of temperature highs, they wander a long way. In the table above, the distribution of lows are roughly centered on the middle range of 45-49°F. If graphed, they would look like the typical “bell curve.” [Feel free to Google these phrases.] But the highs are whacky, or “skewed.” Half of the highs are in the lowest range of 55-59° with 3 outliers in the top ranges. Why, you ask? Very well, here’s my guess. Santa Anas! Hot winds out of the desert, raising temperatures high enough and often enough to skew the average upwards. If we eliminate the top three numbers, which were certainly Santa Ana conditions, the mean drops to 60.3° and the standard deviation drops to 4.0, which is a “heck of a drop” (a technical statistical term). That said, it was a warm January day at the beach, hitting 73° before 8:30am and 81° before noon. I wonder if the high of 85° was a record? 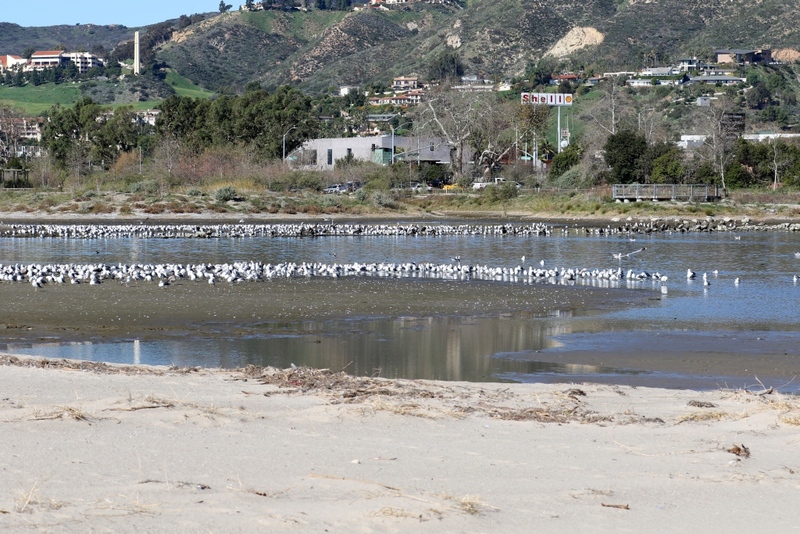 Speaking of records, around forty birders showed up, possibly a record. We dallied, answering many questions, and by the time we reached the beach, many had wandered off in various directions. And now it’s time for the puzzle! The bird below is not rare at the lagoon, so you can put away that Field Guide to the Birds of Bezerkistan. Send us your guess and reasoning why. Honor and fame shall ever be yours! 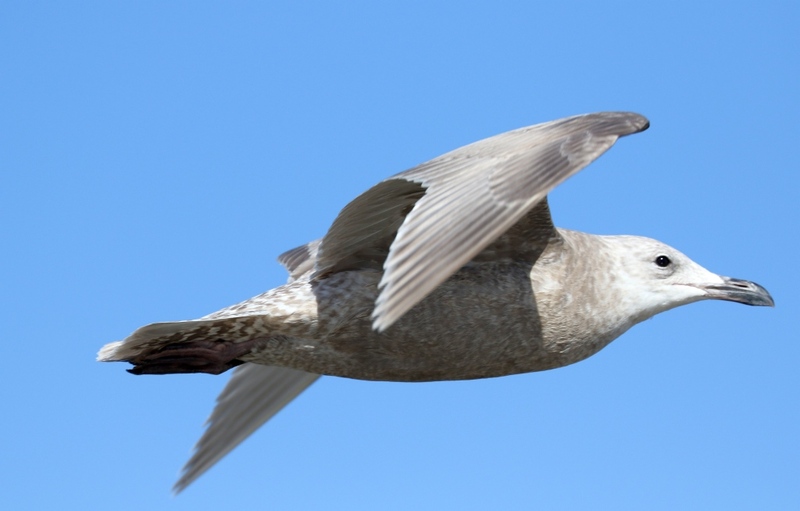 Gull numbers were still high but diversity remained at six species, as the Boneparte’s was replaced by a Herring. The 42 Royal Terns set a new high, beating 32 Boyals on 2/28/10. More kept arriving as morning passed; my guess is that fishing was good offshore and they were coming in to rest. 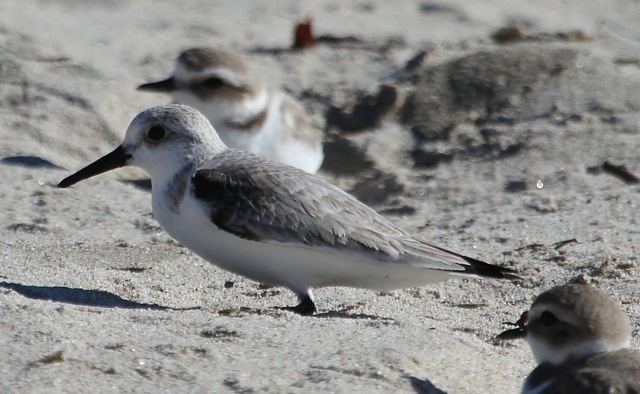 Among the 24 Snowy Plovers on the beach we found banded bird: GA:OY (Left: green over aqua; Right: orange over yellow), his/her third appearance this year. That it fits easily into a human footprint shows just how small these birds are. We had some good experiences with how sunlight affects our view of birds; e.g. they’re a lot more colorful and easy to see when the light is behind you. Photographers know this, of course, but birders are often surprised by it. 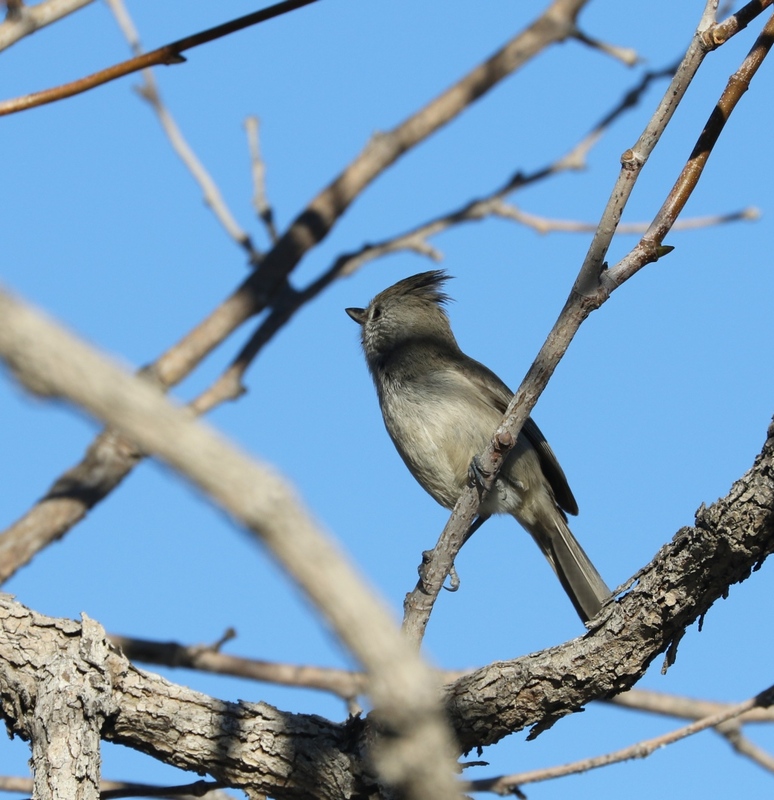 Birds new for the season were: Pintail, Surf Scoter, Pelagic Cormorant, Herring Gull, Mourning Dove, Anna’s Hummingbird, Oak Titmouse, Blue-gray Gnatcatcher, Townsend’s Warbler, House Finch. We’ve not consistently gotten over to Adamson House the past few months, which may be why birds that are always around like Mourning Dove, Anna’s Hummingbird and House Finch have been missed. Our next three scheduled field trips: Salton Sea Weekend, 7-8 Feb, 9am; Malibu Lagoon, 22 Feb, 8:30 & 10am; Hiker Lu’s Santa Monica Area Explorama, 14 Mar, 8:30am. Our next program: Tuesday, 3 Feb., 7:30 pm. The Trancas Lagoon Restoration Project, presented by Clark Stevens. PLEASE NOTE THAT OUR MEETING PLACE HAS CHANGED TO DOUGLAS PARK, 2439 WILSHIRE BLVD. 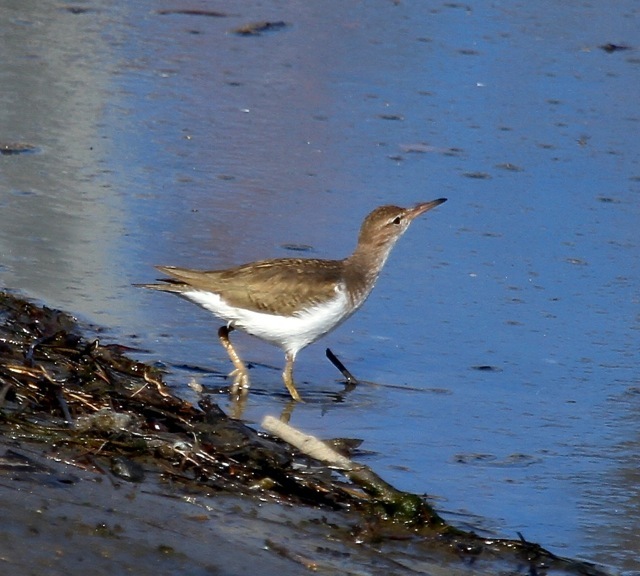 Yes, Spotted Sandpiper. Your correct response was the earliest. BUT…you didn’t say why you thought Spotted Sandpiper. Tsk, tsk.